Later topic: Harrild’s Wood Type Initials ID? 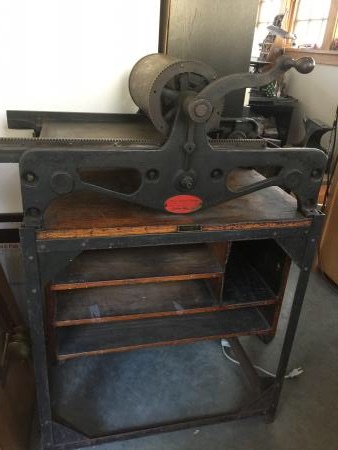 Earlier topic: Help ID'ing these presses? I just acquired a Poco #0, serial# G1643. I’m trying to find out some information about it, specifically the build date. I’ve attached a photo which may or may not help with identification. Also, it came without an ink table - does anyone know where there might be one available? Any help would be greatly appreciated - Thanks! What a nice press!!! These presses work well…..and it is the #1 press at Foolproof Press. Pretty much all his work comes off a Poco…..amazing what you can do with a press like this!!! As for ink table…..we came across one of these a few years back and LOVE IT!!! Since then I’ve made a 2nd one, and in the works is a 3rd one. They look great, clean up nicely and work perfect. Hi, I own a Poco #2 (B288) and this is the best i can find. 1914: Horace Hacker & Co. began as a reorganization of the A.F. Wanner Co. which made Potter and Poco presses. 312 N. May Street, c.1914-21 and in 1915: Hacker introduces Hacker brand hand proof press (The Inland Printer, June 1915, p. 417) Then in 1931: Challenge Machinery Corp. acquires Potter and Poco brands from Hacker. So I’m assuming it was manufactured between 1914 and 1931, Also being a low number I put it as an earlier press. Thanks Paul, and thanks for adding my press to the census!